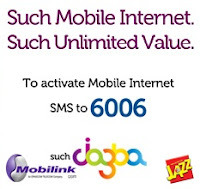 Mobilink introduces daily unlimited internet package for Jazz & Jazba Subscribers. Now Jazz and Jazba subscribers can use daily unlimited internet with no data limit in Rs. 9.99 per day. Hey guys.. i am using this package but it has a very big problem ,mobilink network turns off ur no while u use internet if any one calls on ur no a recorded voice says ( aap k matloba no se jawab mausool nahi horaha ) couple of times i complained to help line but they are not trying to resolve this big issue ..soo plzz raise this issue ..Thankyou.. I have used Mobilink Jazz internet so i request everyone that Please dont subscribe for this. this is very expensive. I think they charged 50 rupees per day. it is very good internet if you use opera mini.it is excellent for suffering the web.but worse for downloading or playing videos.